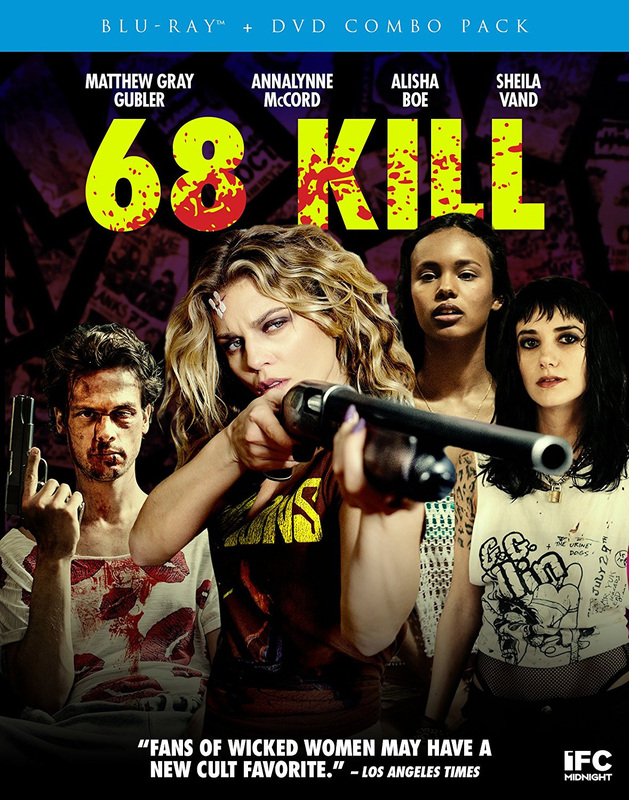 THE B-MOVIE NEWS VAULT: Scream Factory and IFC Midnight bring 68 KILL to Blu-ray/DVD combo pack on January 9th! Scream Factory and IFC Midnight bring 68 KILL to Blu-ray/DVD combo pack on January 9th! LOVE MAKES PEOPLE DO CRAZY THINGS IN TRENT HAAGA'S "68 KILL," AVAILABLE ON JANUARY 9TH FROM SCREAM FACTORY! Trent Haaga (whom I last saw as the leader of the "Diaper Mafia" in Troma's CITIZEN TOXIE) writes and directs this ultra-violent romantic comedy about a down-on-his-luck guy that just can't so no to a pretty face! I've heard a lot of good things about 68 KILL, so I'm definitely eager to check it out when it is released this coming Tuesday! Synopsis: Trailer-dwelling, sewage-pumping Chip (Matthew Gray Gubler, Criminal Minds) may not lead the most glamorous life, but he's got one thing going for him: he's head over heels infatuated with his girlfriend Liza (AnnaLynne McCord, 90210). He's more than willing to overlook her wild streak — the fact that she's hooking up with their landlord, her rather extreme mood swings — so when she proposes a plot to steal $68,000, he goes along with the plan. Matthew Gray Gubler goes from Criminal Minds to criminal acts in 68 KILL! But what was supposed to be a simple heist turns into an off-the-rails, blood-spattered crime spree, and Chip learns the hard way just how deranged the love of his life really is. The new film from Troma alum Trent Haaga blends wicked comedy with pure pulp thrills for a no-holds-barred blast of insanity! Though it is a bare bones release, I've read enough positive feedback about 68 KILL to give it a shot. The Blu-ray/DVD combo pack will be available at retailers on Tuesday, January 9th, and is going for about fifteen dollars. You can order your copy now from AMAZON, BULLMOOSE, or directly from SHOUT! FACTORY.